“What an honor,” we thought. CosmoGIRL! was one of few local magazines we read during our teenage years. 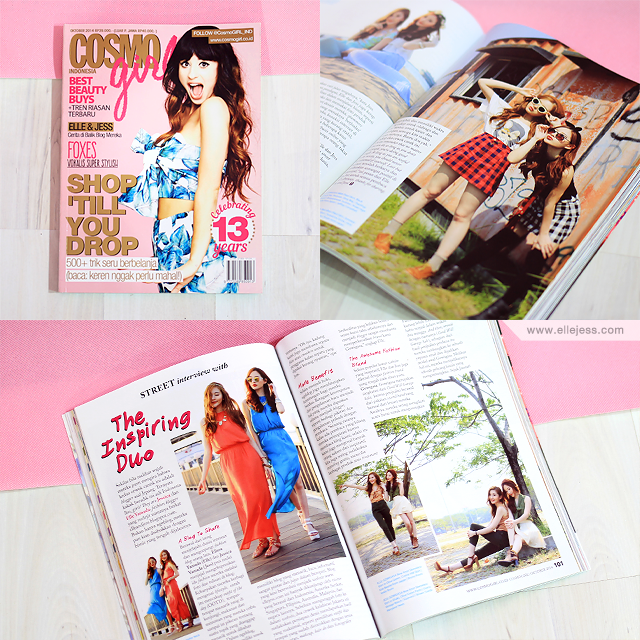 So when Onic; a Feature Reporter from CosmoGIRL! Indonesia contacted us, we were thrilled! But during that time, we were on Singapore filming for Pantene until September 1st and on September 3rd, we were going to Penang for a-week-long family medical check up. CosmoGIRL! could not wait any longer, too, because the deadline was approaching and Onic told us that our name had been approved by US Cosmo for the cover as well omg. So it HAD to be done by September 2nd while we’re in Jakarta, period. Otherwise, we had to pass on such wonderful opportunity.. Luckily enough, everything went well and the shots turn out great, thank God! It's amazing to be featured on that magz! woooaaaa you guys deserve it! you deserve it! i love you fuuuulll dehh pokoknya! Truly Inspiring Duo…. Love u both!